The fourth and final week of November 2018 saw the S&P 500 return back to the box, so to speak, as investors shifted their forward-looking attention back toward 2019-Q1 in setting current day stock prices. The big news of the week, which prompted the shift in the level of stock prices, was Federal Reserve Chair Jerome Powell's speech to the Economics Club of New York, which investors interpreted as his taking a much more dovish stance than he was indicating in previous weeks, where the Fed is now expected to back off on plans to continue its series of quarterly rate hikes well into 2019. 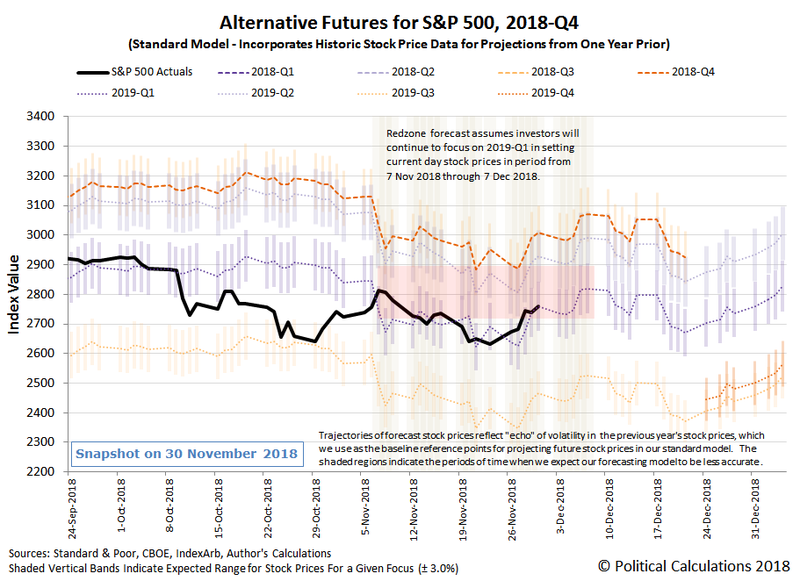 Looking back at the alternate futures chart for the S&P 500, it's pretty remarkable that the trajectory of the S&P 500 has more closely followed our dividend futures-based model's unadjusted forecast for investors focusing on 2019-Q1. That trajectory only exists because of the echo of the Lévy flight event that took place in early October 2018, without which, and without last week's reaction to Apple's bad news, our standard model's forecast for the S&P 500 with investors focused on 2019-Q1 would have more closely fit within the redzone forecast we added to the chart in early November. Still, what neither we, nor anyone else, can do is to anticipate the specific news events that might prompt investors to suddenly shift their attention from one point of time in the future to another, which provides much of the genuine randomness that characterizes this portion of the volatility behind changes in stock prices. Speaking of which, here are the more noteworthy news headlines we identified in Week 4 of November 2018.